Toys are an important part of every child’s physical and mental development. The right kind of toys can further enhance this development. Educational toys in particular are much sought after by parents and are considered as a form on investment in the child’s future. Nowadays, educational toys have become much more trendy and flashy compared with the toys that were produced two or three generations ago. While this may certainly be a source of attraction for both children and parents, there are some dangerous aspects of such modern mass produced educational toys that make wooden educational toys a much preferred alternative. Compared with conventionally produced educational toys, wooden toys are not made from plastics. Plastics are equally harmful for your child’s health and for the natural environment. It is a well-known fact that plastics are non-biodegradable and can exist as trash in landfills for ever. In the process they can leach harmful chemicals to the environment that can pose health hazards for the population. On the other hand, wooden educational toys are made from natural wood which makes them much safer for your child’s health. Wood is also biodegradable and does not harm the natural environment. Modern wood farming techniques have also successfully tackled the concern over deforestation by promoting ethical and responsible wood cultivation. In addition, wooden educational toys are also devoid of poly vinyl chloride (PVC) which is extensively used in manufacturing more light-weight plastic toys. Like plastics, PVC can also leach harmful chemicals onto your child’s skin and when taken into the mouth. 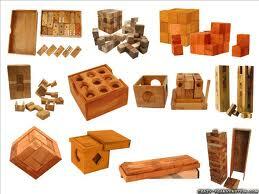 Wooden alphabet blocks, number magnets, animal figurines, stacking toys such as rings and blocks, etc. are commonly taken into the mouth. Wooden educational toys also do not use lead based paint which again has extremely toxic effects on human health. Wooden educational toys like handcrafted blocks and dolls, being manufactured from natural products, have a greater aesthetic appeal and help to bring your child closer to nature. Coming to the mental development of your child, almost all toys manufactured from synthetic materials have a very short fad value. They are manufactured by toy companies to ride the wave of popular trends and fads which increases the sales of the toys. After a while, the toy is replaced with a trendier one and the old toys cannot be used again. They are either thrown away or given to a charity drive. Wooden toys have a more classic charm and can appeal to children throughout their childhood. They are always relevant and can be handed down to younger siblings. Wooden scrabble sets and other educational board games can in fact become family heirlooms! The most important aspect is the development of imagination and creativity. Educational toys manufactured with synthetic materials come in bright colors and a lot of paraphernalia and flashy features. Wooden educational toys are simpler and encourage the child to use imagination and creativity to derive the maximum fun and excitement from the toys. Wooden construction toys and workbenches can be used to develop the child’s motor skills and creativity while protecting the child’s health and his environment.